At Midsummer, the Holly King, God of the Waning Year, vanquishes the Oak King, God of the Waxing Year. Read about them here. Celebrate passion and success. This is a night of powerful magick. Laurie Cabot, in Celebrate the Earth, calls midsummer the sun's sea change, when the sun reaches its peak, and "in one magical instant begins to wane." A midsummer fire was traditionally fueled by the friction between two sacred woods -- fir and oak. The element of fire is an important component of Midsummer, possibly because the sun is blazing in the sky and the heat generates thunder and lightning. Says Cabot: "The tradition of hurling fire wheels into the air or down from atop a sacred hill was a common practice throughout Europe up until the 19th century or even later." As at Beltane, herds were driven through the embers of Midsummer fires to purge them of disease. Rubbing the ashes from the Beltane fire on our foreheads at Midsummer heightens our magickal powers. Midsummer is a good time to seek protection and to purify space against negative or harmful energy. It's also a good time to divine in matters of fertility and love. In ancient times on Midsummer's Eve, young women galloped through fields of growing crops on broomsticks to ensure a bountiful harvest and personal fertility. Protection rituals are appropriate at Midsummer. Some make protection amulets, charge them, use throughout the year and burn in the Midsummer fire -- making and charging a new one for the next year. I had a mini fire in my cauldron at the kitchen table (my altar for now) and burned Midsummer herbs and woods. Make a small pouch out of white cloth. Fill it with any combination of midsummer herbs you wish. (Be sure to add them in threes). Tie the pouch with a red string. Hold the pouch in your hand. Concentrate on any problems, pain or illness you wish to be rid of. Picture these things going into the bag. Throw the bag into the Midsummer fire. In Celebrate the Earth, Laurie Cabot invokes the sorcerer, Merlin (Merddin, Myrddin), who dwells in the spirit of the sacred Oak -- also the Faery Queen and flower goddess Vivian (Merlin's wise teacher) who was made completely of flowers in the Underworld. Midsummer is a very magickally powerful night, and a classic time for works of magick. A good time to tackle the biggies -- spellwork that needs a lot of power behind it. Midsummer is a great time for a re-dedication. sage, mint, basil, fennel, chive, chervil, tarragon, parsley, rosemary,thyme, hyssop, honeysuckle, red heather, white heather, rue, sunflower, lavender, fern, mistletoe, St. John's Wort, mugwort, vervain, meadowsweet, heartsease, feverfew, iris, rowan, oak, fir, pine, aniseed, hazelnut. Burn the nine herbs in the midsummer fire or in a cauldron on your altar: betony wood (or basil), chamomile, fennel (or lavender), lemon balm (or dianthus), mullein, rue, St. John's wort, thyme, and vervain. ll fertility goddesses, including Litha, Vivian, Brighid, Cerridwen, Ishtar, Astarte, Aphrodite, Yemaya, Oshun, Aine, Frigga, Freya. all Sun and fertility gods, including Pan, Cernunnos, Tammuz, Lugh, Balder, Apollo, and Ra. Jump the balefire, cauldron or candle. Burn the Yule wreath now. If you made Sun Wheels at Imbolc, they should be displayed prominently. Paint witches runes (the hagalaz rune), hex signs or other six-pointed figures on wood, paper, or what have you for protection. Hang indoors or out . Midsummer is Gathering Day. Gather plants in the wild, being careful that they don't touch the ground after being cut (their magickal energy will drain into the earth). Perform herbal magick. Go here for the magickal uses of plants. The Teutons gathered ash sticks at Midsummer for wands, walking sticks, staffs, stangs and staves. 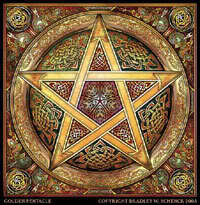 Decorate with magickal symbols, feathers, sigils, words, fabric, ribbon, or whatever you want. Make God's Eyes to be used as a protective talisman or for decoration, or gather buckeye's (horse chestnuts), which was sacred to some Native Americans and used protective amulets. Talismans for our animals' collars should be blessed and given at this time. Make a solar wheel. Wind palm or grape vine into a circle, twisting as you go. Cut two short lengths of stem to be just a bit larger than the diameter of the circle and place one across the back horizontally and one vertically. Decorate with symbols of the elementals -- stones, feathers, shells, etc. and festoon with yellow ribbons. Hang in a tree or inside as a reminder of the God/dess' protection. Make a witches ladder. I incorporate a general purpose ladder into my Midsummer tradition, passing them over the fire before hanging. I'll do specific ones throughout the year as needed. Tie ends and hang up. Commune in the garden at daybreak. (The flower faeries are powerful at this time.) Light votive candles and leave offerings, libations, and gifts for the faeries -- cookies or cakes, fruit, a chalice with spring water (covered to keep bugs out), honey, butter, wine or milk. Bring the water indoors later if it is needed in the ritual. Use it to attract faery power or in magick, as it heightens psychic ability and energy. Cut any herbs that are ready for harvest on this day. Look for the faery folk under the elder tree. Gallop through garden on Midsummer's Eve on a broomstick to ensure a bountiful harvest and personal fertility. Celebrate the day outside hiking, bike riding, swimming, and participating in other summertime activities. Since the longest day of the year is tied to fire festivals, love, beauty, passion and energy, cook spicy main dishes and fresh fruits deserts. Drink blueberry mead. Eat juicy fruits and vegetables, whole-grain breads and dishes with fresh herbs instead of dried (make sure to charge the herbs while cooking). Pork, as it is sacred to Cerridwen, a goddess associated with the season.